Product is pretty cool. Maybe a bit too big, but that’s all. It brings out the "Kingsman" in you! Bought these for a black-tie event and I have to say they went well with my tuxedo. They are slick and makes you stand out of the crowd and the best thing about these glasses are that they are very cost effective! I've even ordered a spare pair incase my original pair get lost or damage. I had laser eye surgery and missed wearing glasses. These are perfect. Just like my old glasses. Very cool and durable, plus the price is just right. Some people like the look that wearing glasses gives them, even if their eyesight is great. In this grouping, all of the lenses are clear. Despite the perceived negativity of the word âfakeâ, fake glasses are anything but negative. Think about it, more often than not, it is simply not sunny enough to justify wearing shades (especially not indoors) and prescription glasses are simply unnecessary for those of us with keen eyesight. It is a well-known fact that glasses are one of the most effective tools for adding or removing structure from your face (depending on face shape of course) and fake glasses are ideal for framing your face at times when neither prescription nor sunglasses are justified. Fake glasses encapsulate all types of glasses which are not required to better eyesight, and are worn for fashion purposes. A member of the fake glasses family, clear lens glasses, achieve the same face-framing effect, but are different in that they always have clear lenses rather than perhaps âno lensesâ or âshuttersâ. Clear lens glasses are not just stylish and a good tool for framing your face â they can also be functional; shielding your face from wind, sand, and other things which might harm your eyes. Certain clear lens glasses also come with added UV protection, this is because UV rays still reach people even when we canât see the sun. Clear lens glasses go well with any outfit. The frames of clear lens and fake glasses come in a variety of different shapes, sizes, and colours. Ranging from understated and professional â to preppy and exciting. No matter the occasion, fake glasses can be paired with your favourite outfits, and achieve a perfect match. Frame types can vary, in material and design. Clear frame glasses are glasses with translucent frames â as the name implies. They offer a dash of new, to already classic styles and silhouettes; and with the new wave of progressive music such as cloud rap and vaporwave â they complement parties and events surrounding these styles. As important it is to have a good, clean, well put-together wardrobe; statement pieces such as these which stand out from an otherwise classy outfit add a contrast which turns an understated outfit into a bold piece without screaming âlook at me, I need attentionâ. The kind of glasses Bill Gates wore when he was a teenager. These glasses which were once the symbol of a man stuck to his computer screen, have transformed vastly to become the symbol of someone who is into things such as comic books, games, books and other introverted things. Geek glasses are for the introvert who has accepted themselves and loves themselves. An excellent declaration of self-acceptance. 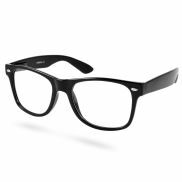 A specific term for fake glasses â these are glass frame types which were originally worn by, well, nerds; being a nerd is thankfully no longer considered negative and these glasses represent the acceptance and openness of modern society. By wearing frames which were once associated with negative feelings, you are telling the world that you are caring and accepting of others, no matter who they are. Clear lens fashion glasses are a fashion statement. No matter your style, clear glasses will work with it. Currently fashion is shifting â no longer does fashion want to sacrifice function over form, and while clear lenses do not offer much in function, they do nothing to remove functionality either â yet offer a simple and cheap way to enhance facial features. Clear lens glasses fashion a new way of looking at things. Glasses with clear lenses are not to be confused with regular glasses. Clear lenses can be worn by anybody, and will not have a detrimental effect on eyesight, however it will not improve eyesight either. Clear lens does not mean a lens which is transparent, but a lens which is both transparent and completely neutral â consider them a high-quality window for your eyes. Unlike clear frame glasses, clear frames do not come with lenses. Instead they are simply frames with nothing covering your eyes. These kinds of frames are best suited for those who want to keep their eye area breathable, and virtually unobstructed. The name may also imply (depending on context) frames which are lens-less and also transparent acrylic or plastic. These are also called clear eyeglass frames. The aviator silhouette is an all-time classic. These kind of clear lens glasses are not available in only frames, as the aviator silhouette has very thin frames and the lens is the primary focus. Aviators are generally better to wear in sunglass form, due to their non-prominent frames (clear lens glasses benefit from a strong frame). Should you want a pair of aviator sunglasses, these too are available on trendhim. Clear lens glasses are fashion accessories, and can be purchased without a prescription â note however that they do not improve eyesight. If you are in need of glasses which improve your eyesight, please consult with a professional optician. In order to make sure you do not suffer eyestrain while wearing them, it is important to make sure the lenses (if you order clear lenses, not exclusively frames) are kept clean and relatively scratch free â these contaminants on lenses can create focus problems for healthy eyes; the easiest way to avoid this, is by wiping them off with a soft cloth when you notice debris. Eyeglasses are another word for glasses, often used by older people. They mean the same thing as clear lens glasses, except if otherwise stated. Clear eyeglasses could mean vintage style as well. Eyeglasses have been around for many decades and in their newest form, they are becoming less of a necessity, and more of an accessory â like hats, rings and bracelets. Eyeglasses have excellent complementing abilities, and can alter the shape of a face. In case you were worried that clear lens glasses could only be worn by women, this is not the case. Men are just as able to and welcome, to wear clear lens glasses â they are not gender exclusive. In fact, clear glasses are equally, if not more popular with men than with women. Men have been styling clear glasses now for several years, and clear glasses have become a staple for some of the most fashionable individuals. Like the aviators mentioned above, retro rounded or semi-rim style glasses have an unmistakable, timeless style. These are without question, the most popular silhouette of fake glasses, as well as regular, and sunglasses. Retro glasses come in multiple sizes, the classic being the larger, more bold item, with the modern versions being smaller and more sleek; as is popular with fashion nowadays. They are truly the most versatile style of eyewear, and clear lens glasses are no exception. Wear them with anything, and select any of the classic colours. Clear lens glasses are more affordable than their prescription and sunglass counterparts, this is because there is no major production process to make them polarized, curved lensed, crystal lensed etc. It has been said âSimplicity is keyâ when it comes to style, and clear lens glasses fit the bill perfectly. Do not however be fooled, just because something is cheap does not make it low quality, these glasses we list on our web-shop are high quality through and through. Retro is back with a vengeance, and this is just not limited to sunglasses, it is also available in glasses that have clear lenses. If you are the type who likes a little extra attention then clear lens glasses are a "must have"! Often referred to as" Nerd" glasses, there are several models in various colours for your selection. If this look is not for you, then look at our sunglasses for men. All glasses and sunglasses purchased from us come in microfiber bags and are delivered in protective packaging. We encourage you to look at our other product lines so that you might find some other accessories that will fit your unique style!